So what do we have going on here? What is the hero Perseus and the Pacific Northwest Sacred Grid doing? A) There is the Cascadia Subduction Zone which involves the Juan de Fuca, Pacific and North American plates off the coast of Oregon, Washington and British Columbia. As everyone is aware, a highly fragile area in the Pacific Rim of Fire. B) In numerous Native American prophecies they speak of Mt. Rainer as "Grandfather Mountain" blowing his top at the end of this cycle. One of them is a well known prophecy that speaks of the Two Twins, the Grandmother and the Grandfather called The Firebird Prophecy. While Perseus is standing alongside North America from British Columbia to Mexico, his arm and hand holding the red rod stretches out into the Seattle area, across Washington, into northern Idaho and back into British Columbia. To me Perseus feels like a "guardian" pointing the way to the galactic center as if that is the way to go and what humanity should be focusing on. The great hero is holding the "rod or staff" that aligns and connects East to West while he pierces through Draco, Polaris and Ursa Minor. There is a whole slew of alignments going on within this sacred grid due to the configurations such as the Angel, Hatman, Wall of Faces and the three in the center, Sphinx, WolfShaman and the Persian(?) and their alignments that comprise the cross and it's alignments. Then we have the inner alignments of the sacred grid itself. So what is going on here? 1) In the north planetary alignment below, the Angel is looking 90.75 degrees east to the sunrise and Venus (lavender line) through Yellowstone and the Tetons to Auriga's kids, crossing America to North Carolina where there is evidence of devastating comet impact. On the star map she looks to Auriga's Kids and Pollux in Gemini off the east coast of North America. Gemini was associated with the myth of Castor and Pollux, collectively known as the Dioscuri. One myth of these twins concerns cattle theft, and may be connected to earlier myths that described the Milky Way as a herd of dairy cows. On star maps, the twins are usually viewed as leaning away from the Milky Way, but are sometimes depicted with one of the twins residing in the Milky Way, and the other outside it, a situation making it appear that one of the twins is stealing the cattle, and the other is observing. When Castor died because he was mortal, Pollux begged his father Zeus to give Castor immortality and he did, by uniting them together in the heavens. 2) The America's Ancient Route originates at the Angels triangle extending out from her throat, as do most of the configurations, then runs through the America's connecting with the three other sacred grids and their star systems, ultimately aligning to Peru and Sirius, the throat center of Canis Major. What this tells me is this ancient route pertains to sacred areas of communication of knowledge from Sirius, Pleiades, Orion, Perseus and the Angelic Realms. 3) The two configurations facing each other in the center of the sacred grid are looking directly to Sirius and Peru, what are they telling us about Sirius and Peru, what is there for us to learn from or travel to? 4) The Hatman looks to Perseus. The Cross..........In the SE planetary alignment only. It really surprised me that the Southern point of the cross where the Angel is, does not align to any star system. It is as if the Angel is grounding in the energies of the Cross through her into the land as she does with the rod of Perseus connecting East and West. Therefore, it is from the Angel that the Harney Cross is rooted and originates. 1. The vertical portion is the symbol of spirit - descending to earth from above. It is the God force of light & love-wisdom. 2. The horizontal section is matter (or man in physical form). 3. At the intersection of the two is man, in the physical, meeting spirit. The place on the cross where the two intersect is slightly above center at the point of the heart or love. 4. The result of the two intersecting is wholeness; Vertical = Father. Horizontal = Son. The two together is wholeness or Holy Spirit or God made manifest in the physical. As you might recall, the Angel is located along the inner alignment of the Sacred Grid that stops at the Table Rock, Idaho point. While researching Table Rock, I came across an article that discusses an illuminated 60-foot cross at its summit. 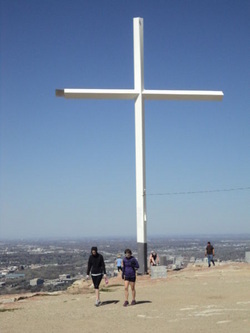 The cross itself stands on four square feet of land bought by the Jaycees for $100 in 1972. So, let's review what the Angel is doing. She looks to the East across the United States to the head of Pollux and onto Venus as the morning star. Originating from the triangle extending out from her throat, she grounds in Perseus' Pole that travels north through Polaris, Draco and Ursa Minor onto the opposite Angel site in the Aral Sea Sacred Grid bridging East and West as shown in the blue line. It is from her throat the Ancient Route travels down through the America's and Lake Titicaca to Tiahuanacu Gate and onto Sirius as shown in the white line. Ironically, it is the same "pathway" when I align the southern base of the Harney Cross where the Angels throat is to Urcos Cross in Cuzco, Peru as shown in the dark purple line going through Auriga, Taurus and Orion. The magenta line extends from the tip of the Angel's throat triangle where the southern base of the Harney Cross is located, across the Atlantic through Ursa Major onto the Hendaye Cross in France. Hence, the Angel is not only communicating with the Sacred Grid of Peru and Sirius, the Urcos Cross, East and West through the Perseus' Pole, but to the Hendaye Cross as well.......Remember the anagram of Hendaye Cross = Harneys Codes? What is the Hendaye Cross communicating? There is a place of refuge, Inca Cave Cuzco Peru. Where does the Ancient Route go? Peru. The Pacific Northwest Sacred Grid with it's star system Perseus is aligned to many different star systems such as Sirius, Auriga, Cetus, Gemini, Sagittarius, Aries,Taurus and the Galactic Center. It also aligns with various countries including Mexico, Guatemala, Ecuador, Peru, Bolivia, Uzbekistan in Central Asia and France.